The majestic sound of Russian bells will fill the air at historic Fort Ross this Saturday as San Francisco Symphony Percussionist Victor Avdienko performs a special concert for the 4th annual Fort Ross-Seaview Wine and Harvest Festival. 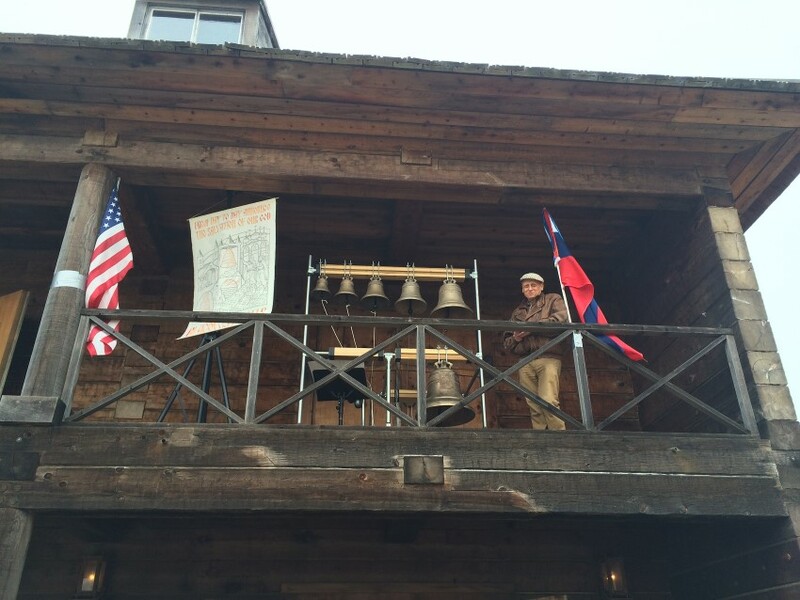 Since the founding of Fort Ross in 1812 by the Russian-American Company, a trading and fur trapping firm, Russian bells have had a place of prominence. They were utilized both as signal bells at the fort’s two sentry boxes located diagonally in its Northern and Southern corners and, after 1824, as church bells in the belfry of the fort’s Holy Trinity–Saint Nicholas Chapel. On Saturday, the peal of six Russian bells will serve a purely musical purpose in America’s Second Secular Russian Bell Concert which will take place at the Visitor’s Center at 1:10 pm. 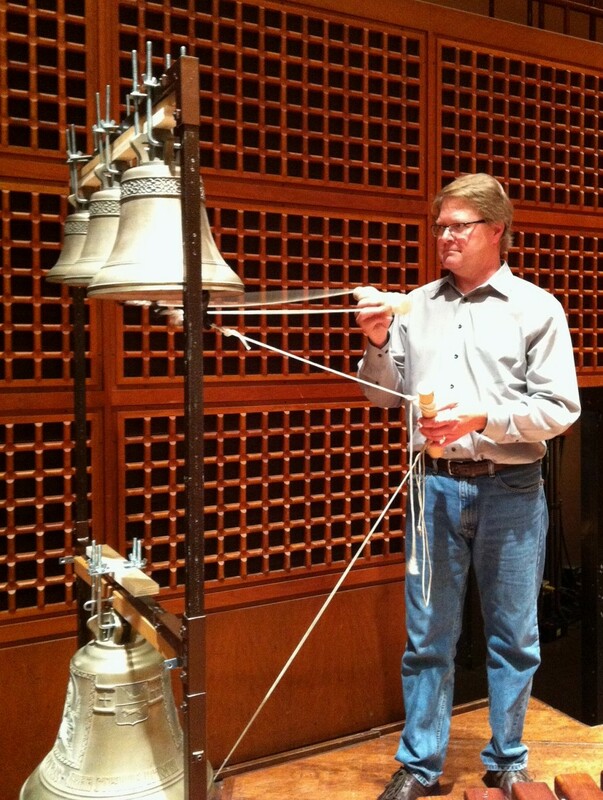 The concert is produced by Mark Galperin, General Manager of Blagovest Bells of Novato, the sole promoter of Russian bells and bell-ringing in the U.S.
Percussionist Victor Avdienko has performed, recorded, and toured with the San Francisco Symphony (SFS) for 20 years. He was brought up in San Francisco’s Holy Virgin Cathedral Russian Orthodox Church on Geary Street but, during those days, he never heard authentic Russian bells played live there. Instead, he heard plenty of recordings of majestic Russian bells which always fascinated him. His performance of Tchaikovsky’s “1812 Overture” with the San Francisco Symphony in the summer of 2014 was the first time authentic Russian bells were ever used for that very popular piece in the United States. Galperin organized the loan of those bells to SFS from San Anselmo’s St. Nicholas Orthodox Church. 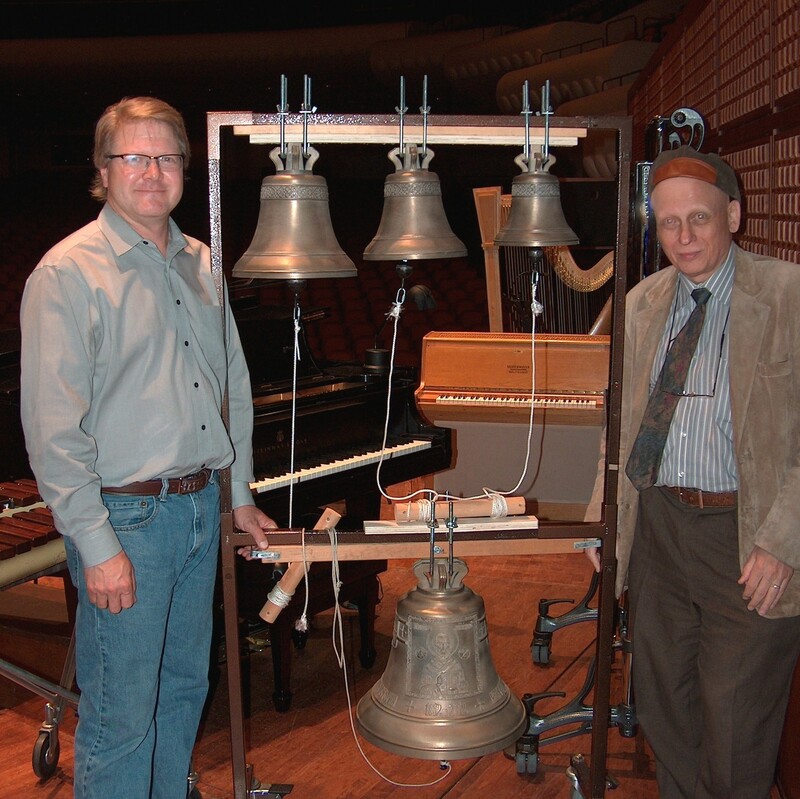 He had also lent Blagovest Bells’ 5-bell Russian demo peal to SFS for its Keeping Score Summer Institute in June 2009. The friendship between Galperin and Avdienko was solidified over their mutual love of bell music. 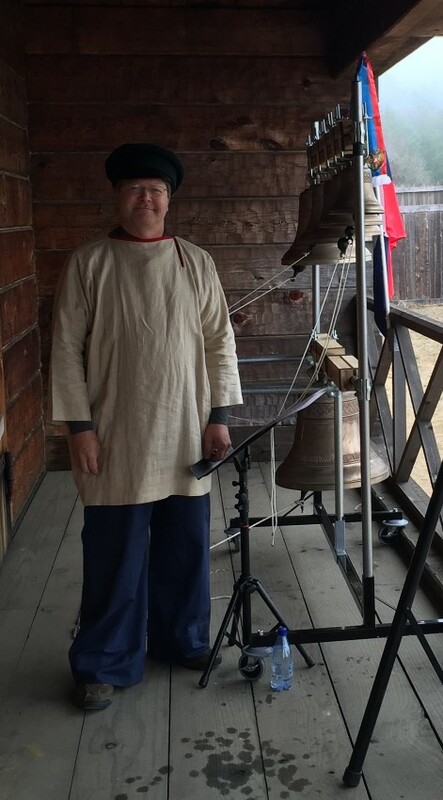 Avdienko and Galperin’s first independent concert, America’s First Secular Russian Bell Concert was held at Fort Ross during the 3rd Fort Ross Harvest Festival. Saturday’s outdoor concert at Fort Ross will occur rain or shine. In addition to Russian bells, the folk group Dolina will also be performing a number of traditional Russian and Cossak folk dances throughout the day. To read ARThound’s 2014 feature article on SFS percussionist Victor Avdienko and the first Russian bells to play at Green Music Center’s famed Weill Hall, click here. Details: The bell concert is 1:10 PM on Saturday, October 15, 2016 at the Fort Ross Visitor Center, Fort Ross State Historic Park. The concert is free but visitors must pay park admission of $20/car which includes entrance to the Fort Ross Harvest Festival. Fort Ross, is located 11 miles north of Jenner on Highway One and is the main tourist attraction between Bodega Bay and Fort Bragg. The Fort Ross Harvest Festival is Saturday, October 15, 2016 from 10AM to 6PM and offers a full day of world-class wine tasting, a wine seminar featuring rare wines grown in the remote steep mountain top Seaview region, apple picking in a historic apple orchard, delicious local foods, historic crafts and music and Russian dancing, all set on the spectacular Sonoma Coast at Fort Ross State Historic Park. Entrance to the festival is $20/car and wine tasting tickets range from $40 to $90 depending on category of wine tasting. 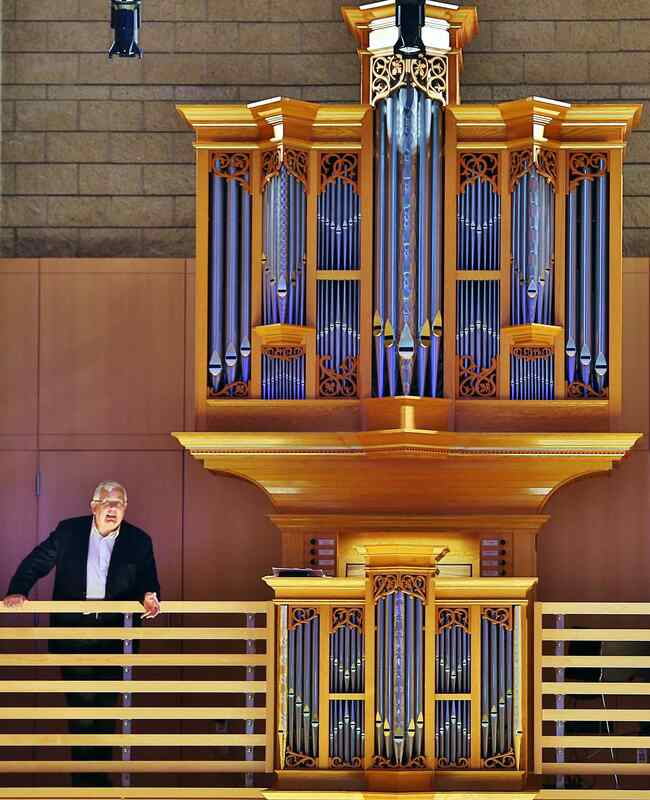 This evening at 5:30 p.m., Christie will perform this pipe organ’s inaugural concert in Schroeder Hall with selections by Georg Böhm, Jan Pieterszoon Sweelinck, Johann Heinrich Buttstett, Dietrich Buxtehude, and Johann Sebastian Bach. Schroeder Hall celebrates its grand opening this weekend with 8 free concerts designed to introduce it to the community and to road-test its acoustics. The concert is sold-out but you still be able to score tickets. Show up early and wait in the stand-by line by the GMC ticket office. IF told holders do not get their tickets scanned 10 minutes before the performance as they enter the hall, their tickets will be released and depending on your place in line, you may get in. Sale begins today, Wednesday, July 23 at 10 a.m. and ends Friday, July 25 at 10 a.m. and features $10 tickets for all remaining seats inside of Weill Hall to Saturday evening’s performance by the Grammy Award-winning San Francisco Symphony. The orchestra brings an all-Tchaikovsky program to Weill Hall and Lawn this Saturday, July 26 at 8:00 p.m. followed by a spectacular fireworks show over the Sonoma Mountains. The program includes the composer’s famous 1812 Overture, the Waltz from Sleeping Beauty, Marche Slave, the International Dances from Swan Lake, and PianoConcerto No. 1 in B-flat minor, featuring Trpčeski. 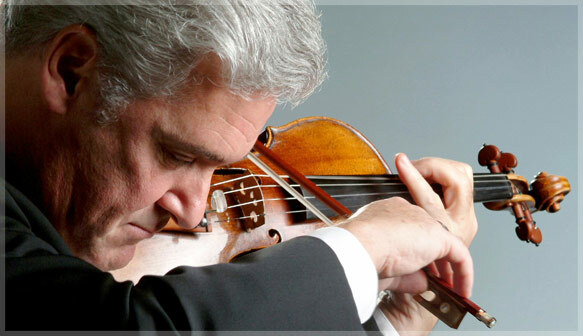 Renowned violinist Pinchas Zukerman will perform the Bruch Violin Concerto at Weill Hall on his prize 1742 Guarneri del Gesù on Tuesday, July 15, 2014 as part of Napa Valley Festival del Sole. Tenor James Valenti rounds out the evening with arias from French and Italian opera with Alondra de la Parra conducting. Photo: courtesy Festival del Sole. Last summer, I became a Napa Valley Festival del Sole devotee when a friend suggested that their tribute to Russian composer Sergei Rachmaninoff looked really good and got me a coveted ticket. I had the exquisite pleasure of attending a rare performance of a portion of Rachmaninoff’s long-lost 1939 ballet, “Paganini,” brought to vibrant life by members of Ballet San Jose, American Ballet Theatre and San Francisco Ballet. The experience continued with an intimate wine reception at the Napa Valley Museum where we saw a special exhibition featuring materials uncovered during the ballet’s restoration. Since its founding in 2006, Festival del Sole has showcased more than 300 preeminent artists and ensembles and paired them brilliantly with luncheons, dinners and, tastings at some of Napa Valley’s the most breathtaking venues. This Tuesday, the festival returns to Sonoma County to Green Music Center’s acoustically magical Weill Hall. Acclaimed violinist Pinchas Zukerman makes his debut with Festival del Sole and performs the ever popular Bruch Violin Concerto from 1866, which epitomizes how romantic music should sound— rich, melodic and lyrical. Tenor James Valenti, celebrated by the New York Times for his “robust, ardent singing,” rounds out the program with favorite Italian and French opera arias. Alondra de la Parra will be conducting the Sphinx Symphony Orchestra, the unique all Black and Latino orchestra comprised of top professionals from around the country who will close the evening with Antonín Dvořák’s Symphony No. 8 in G Major, Op. 88, a glorious and richly diverse piece that ought to showcase both the orchestra and de la Parra’s spellbinding conducting style, a ballet like performance in itself, said to coax musicians to greatness . De la Parra, of Mexican ancestry, is known for her electric energy and holds the distinction of being the first Mexican woman to conduct in New York City. She has been hailed as one of the brightest young talent to show up in recent years. Tuesday concert Details: “Alondra de la Parra, Pinchas Zukerman, James Valenti and the Sphinx Orchestra” perform at Weill Hall on Tuesday, July 15, at 6:30 p.m. Lobby and will call open at 5:30 p.m.; concert hall opens at 6 p.m.; concert starts at 6:30 p.m. Tickets: $35. There are a few remaining tickets. Advance purchase is essential. Click here to purchase tickets. 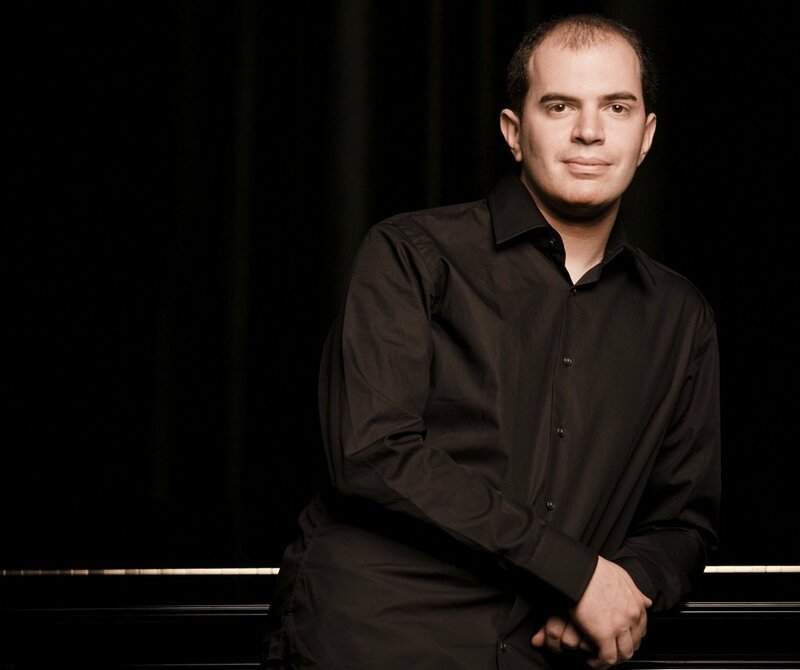 Pianist Kirill Gerstein says it’s a “special thrill and a tickle” to come to the Wine Country and perform at Weill Hall. The virtuoso performs Beethoven’s Second Piano Concerto on Thursday, June 5, as part of “Dutoit Conducts Beethoven and Shostakovich,” the final concert in the San Francisco Symphony’s 2013-4 Weill Hall performance series. Gerstein is the Winner of the Arthur Rubinstein Piano Competition and the recipient of a Gilmore Artist Award. Born in Voronezh, Russia, in 1979, classical pianist Kirill Gerstein was the winner of the 2001 Arthur Rubinstein International Piano Master Competition in Tel Aviv. In 2010, he was awarded the prestigious $300,000 Gilmore Artist Award. Gerstein first touched foot in the U.S. at age 14, when he went to Berklee College of Music in Boston as a jazz pianist (their youngest student ever). There wasn’t any live jazz to be heard in Voronezh, but Gerstein fell in love with it by listening to his parents’ extensive record collection and it was his skill at improvisation that led to a scholarship to Berklee. He went on to tackle classical repertoire in summers at Boston University’s Tanglewood Institute and earned both his bachelor’s and master’s at the Manhattan School of Music at 20. Gerstein, now 35, has spent his life balancing his love of classical music and jazz but chose to focus his energy on classical playing. And what a life he’s crafted. With his technical prowess and ability to communicate his connection to the music, he’s emerged as one of the most respected and insightful pianists of his generation. He manages a global touring schedule that includes recitals, chamber music and concerto solos and carves out time to teach. Since receiving the Gilmore Award, he has commissioned boundary-crossing new works from Oliver Knussen, Chick Corea (Jazz), Brad Mehldau (Jazz) and Timothy Andres, and additional commissions are in the works. This Thursday, at Green Music Center’s Weill Hall, Gerstein performs Beethoven’s “Piano Concerto No. 2” with Charles Dutoit and the San Francisco Symphony. Shostakovich’s “Symphony No. 10” is also in the program. Composed after Stalin’s death in 1953, this piece, since the late 1970’s, has been seen as a depiction of the Stalin years in Russia and is considered one of the most devastating essays in the twentieth-century symphonic literature. This is the final concert in the San Francisco Symphony’s 2013-4 Weill Hall performance series. The concert will also be performed at Davies Symphony Hall Wednesday, Friday and Saturday. Gerstein’s latest album, Imaginary Pictures (Myrios Classics) which features Schumann’s “Carnaval” and Mussorgsky’s “Pictures at an Exhibition,” will be made available this week at Weill Hall and at Davies Symphony Hall in San Francisco, before its general release on June 10. Immediately after each concert, including Thursday’s performance, Gerstein will be greeting the audience and signing copies of the new cd in the lobby. Gerstein’s recording in 2010 of the Liszt Sonata “Humoresque” and a piece by Oliver Knussen, also on Myrios Classics, was considered one of the best recordings of 2010. Yesterday, in between rehearsals, I had the pleasure of speaking with Kirill Gerstein about his extraordinary career and his commissions. Known for his fiery, dramatic playing, his vocal style is crisp and to the point. In short time though, he demonstrated that his musical curiosity and insights are profound. You were born in 1979 in very interesting part of Russia, Voronezh—the intersection between Urals and Siberia and Caucasus and Ukraine…a real hinterland. What did you do for fun there growing up? And when did your love of music really take hold? I generally have fun and I don’t think, even as child, that I made a distinction between fun and non-fun—it was all fun and I didn’t have any realizations about something missing in Voronezh. I enjoyed studying music and reading and my parents made sure that I spoke with a lot of people. I wasn’t the tortured prodigy you sometimes read about. I practiced but not those crazy amounts you hear about. And when did your love of music really take hold? Kirill Gerstein: Music has always accompanied me. My mother is a musician and she taught college but she also taught at home and the piano was there and she was my first teacher. I don’t remember any time without music or the piano. So it wasn’t a certain moment or lesson, it was just always there and my interest increased. Most of my exposure was to classical music. I went to a lot of concerts. The jazz was only from recordings as there wasn’t really an active jazz scene in Russia. There was a bit in Moscow, but not very much, and certainly not in Voronezh which was not a capital city. I really liked Chic Corea and Keith Jarrett and listened over and over. In reading about your life, it seems like praise has been heaped upon you since you were a child. Who’s been the most influential teacher you’ve had and why and what hurdle did that person take you over? Did you immediately win him or her with your playing, or was it more of a brutal relationship where you really had to strive? Kirill Gerstein: There was a lot of praise and heaped is correct. Studying music is a process where you encounter a lot of criticism that accentuates your weak spots as a player and as a person and that’s how you learn. The process is to do justice to the music. The two most important teachers I had were Dmitri Bashkirov in Madrid and Ferenc Rados in Budapest. Both of them, especially the first time, were very harshly critical of what I did but it was clear to me that they had some very valuable information that I wanted and needed. So, in spite of the ego bruising, I stayed with them and worked with them. With Dmitri Bashkirov, who I had heard in Voronezh in concert as child, because he happened to give regular concerts there, I was transfixed, so that was particularly important. I first played for him in Spain when I was about 17 and he was harsh but there was such insight. I kept returning and, finally, I broke through and began to really develop my playing and took his class. I worked with him for years. The lives and careers of Beethoven and Shostakovich were separated by over a century and in their works we can see how they wrestled with these big themes of freedom, liberty, and politics. The concert, I hope, will illuminate some of the subtler, musical traits that these composers have in common. What comes to mind for you in the pairing of the No. 2 and Shostakovich’s “Symphony No. 10”? Kirill Gerstein: I think this is a good pairing. In terms of Russian composers of the 20th century, Shostakovich was a composer of great symphonies. The symphonic composer was really defined, or let’s say redefined, by Beethoven in ways that impacted every subsequent generation from Brahms onwards, including Shostakovich. Mozart and Haydn wrote very important symphonies but Beethoven with his nine symphonies is really a towering presence who went beyond classical music to impact all of Western culture. Shostakovich was aware of this and in many ways inspired by these symphonic models and the two do go very well together. You could say that, in some ways, Shostakovich modeled his compositional ideals on Beethoven, not necessarily the style but concept behind it, and you have the important body of string quartets by both composers for which this also holds. The two pieces on Thursday’s program are very different in sprit and mood because the “Symphony No. 10” is a later piece of Shostakovich whereas the Beethoven “Piano Concerto No. 2” was actually composed first. This is really the most youthful of his five piano concertos, where he’s just starting to depart form the models of Mozart and Haydn but it does so boldly, just as he lived his life. In this concerto, he does show that he has studied and absorbed the great models of Mozart and Haydn but also that he has much to say that’s very original. It’s also a piece filled with lots of humor and a beautiful second movement that’s very much inspired by the Italian operatic traditions because one of his teachers was Antonio Salieri, very influential. On Sunday, at Davies you’ll be performing a very special chamber music concert which includes the Shostakovich “Piano Quintet in G minor, Opus 57 and the Dvorak “Piano Trio No 4 in E Minor, Opus 90.” The third movement of the Shostakovich is this amazing scherzo and trio that has a kind of dark sarcasm to it. What’s your favorite part of this piece? Kirill Gerstein: Well, I clearly like the entire piece. You’re right, the third movement is a style of overt optimism, projected and fitting for the Soviet period but underneath anyone can detect this is not happy at all but quite the opposite. This was a very common M.O. for Shostakovich…happiness on the face and darkness in the soul. How do you prepare before a performance? Is there some routine you adhere to? Kirill Gerstein: I try not to subscribe to any routines because then you end up breaking the routine and it becomes all about that. There’s a lot to coordinate—your own travel schedule, rehearsal times vary, the pieces are all varied. Trying to have a routine is a very futile undertaking. And the preparing, well, the performance is really a window into something that’s a very continuous process that I think about all the time. I practice the piano whether there is or is not a concert. Of course, a public performance brings a wonderful inspiration to the performer who has his life in music. You have an ongoing collaboration with Charles Detoit, who will be conducting this Thursday. You obviously have a special rapport. What clicks? Kirill Gerstein: Well, I met Charles probably ten years ago and he has been a wonderfully supportive collaborator and mentor in quite a variety of repertoire—German, modern pieces, and now the Beethoven Concerto No. 2. I really feel an established musical and personal connection with him and can say that he is someone who is always inspiring to be with. Professionally, he’s very accomplished and generous. Your new album, Imaginary Pictures, to be released June 10 by Myrios Classics, features Mussorgsky’s “Pictures at an Exhibition” and Schumann’s famous “Carnaval,” both cycles of piano pieces in which the visual was the departure point that fired the composers’ imaginations—in one case actual drawings by Victor Herman and the other, masked revelers at a party. I’d love to hear your thoughts on your pairing of these magnificent works. Also, in preparing for the recording, was there anything new you found in these works? Kirill Gerstein: There are several reasons to pair the two. Certainly, they both have overtly visual starting points but it’s not just ‘simple paintings in sound,’ which is the obvious parallel. Both composers go much deeper to create a psychological portrayal of how they viewed the subjects and ultimately it becomes more about them as observers. The composers themselves were both self-taught and they had this kind of wild unbridled imagination in common which led to unexpected wonderful things appearing from nowhere. They knew the academic and classical traditions very well but were always pushing the boundaries, so even though their music sounds quite different, the creative spirit is a kindred one. And yes, the pieces are very popular but that wasn’t sufficient—unless there was something new and somewhat subjective and different to bring to the piece, there was no point to record it. I decided to record them because, when I looked at the score on the page, some things appeared differently to me than I was used to hearing. For example, in “Pictures at an Exhibition”—one of the most played pieces in the piano and orchestral repertoire—some things felt like discoveries to be explored. Of course, the process of recording itself stimulates this feeling of discovery. I heard that you wrote the liner notes for this album too. Kirill Gerstein: I did that for my previous cd too by the way. Generally, I enjoy writing. I’ve written for the gallery section of the New York Review of Books website and that’s something I intend to do more of as I enjoy the process. To me, that’s part of being a well-rounded expressive person not just a pianist pressing buttons on a keyboard. (Click here to read Kirill Gerstein “Tchaikovsky’s ‘Wrong’ Note,” NYR Gallery, August 13, 2013.) Specifically, this was also an invitation to think more about the pairing and what the music is trying to express, the philosophical territory. Speaking of visual inspiration, many composers embrace other art forms for inspiration with their music. What other art forms have you found strong inspiration in? Kirill Gerstein: In general, movement is inspiring, so dance is influential, but so are painting, poetry, prose and performances from great actors as well. Architecture is something that is inspiring for thinking about music. But these aren’t direct influences; they are indirect and after some time. It’s letting myself be inspired by the many things I encounter, like seeing a great sushi chef cut the fish with a fluid movement that repeated by his hand time and time again—that’s an aesthetic pleasure that has inspiration. In the end, it’s about walking with your eyes open. You won the Gilmore Artist Award in 2010, which is given every four years—one of the most prestigious and generous awards a concert pianist can receive. The cash prize of $300,000 stipulates that $250,000 is to be put toward “career development.” I understand that you are putting that to use by commissioning works by living composers, including jazz composers. Can you tell us a little about the pieces you’ve commissioned so far and what is in the works? Do you have ongoing interaction with these musicians? Kirill Gerstein: I’ve purposefully chosen very different individuals. There’s a great figure in modern music, Oliver Knussen, the British composer and conductor. On the other hand, there’s the young up and coming American composer and pianist, Timo Andres. Andres’ “Old Friend” had its world premiere at Boston’s Jordan Hall on Jan 31, 2014 and I played the piece. There have been a couple of jazz-related commissions—the great jazz pianists, Brad Mehldau and Chick Corea, have both written pieces for me. The idea was to pass this money on to other artists, in this case composers, and in return, to get an artwork that for the initial period is exclusive to my concert programs, an additional benefit. Eventually, the pieces will be for each pianist to play and they will add variety and enrich the piano repertoire. It’s been very rewarding being part of the impetus that gets new pieces created and out there. The exchange between the music creator/composer is another source of inspiration and something that shows you how some of the great golden composers—Beethoven, Rachmaninoff—may have participated in that process of collaboration between composer and performer. Did the composers you commissioned meet your expectations? Kirill Gerstein: I try not the have expectations. I let myself be surprised not only by the composers but by life in general—it’s mentally more efficient. I have been very satisfied with all of the works and inspired by the process. Speaking of inspiration, what type of music do you listen to when you want to relax? Kirill Gerstein: When I relax I don’t listen to music usually. It’s such an intense process for me that it snaps me back into this very engaged mode. And I don’t listen to background music either. You started life in Russia, moved early to the States and now your parents live in Boston and you teach at Stuttgart’s Musikhochschule, and your wife, Noam, is from Tel Aviv. Which place do you consider home and how do you define home? Kirill Gerstein: This is very philosophical and should be the subject of an entire interview but, having had this varied history, I feel at home in many places. Obviously, you give up some feeling of being rooted but on the other hand what I’ve gained is being at home and comfortable in many places in the world and in different cultures and circles. Something lost, something gained. Have you ever been to the Wine Country where you’ll be preforming this Thursday? Kirill Gerstein: Yes I have. I really enjoy the wine making region so this is a special dream and tickle. A lot of the wine that I particularly enjoy comes from this area. Concert Details: For tickets and more information for Thursday’s Weill Hall performance “Dutoit Conducts Beethoven and Shostakovich”, click here. Tickets can also be purchased in person tomorrow at the Green Music Center Box Office for this concert, at 7 PM, one hour in advance of the concert. For the three San Francisco performances of the concert at Davies Hall, click here. For tickets and more information about Sunday’s Chamber music concert, click here. On stage at Davies Hall, San Francisco Symphony (SFS) Concertmaster Alexander Barantschik seems to epitomize the intense and mysterious Russian. The virtuoso always looks quite serious as he juggles his orchestra leadership role with that of first violinist who plays “The David,” the illustrious 1742 Guarnerius del Gesú violin, famed for its rich dark sound. I’ve always wondered what makes Barantschik tick and about the particulars of his Russian musical upbringing. When I had the chance to interview him in conjunction with “Barantschik and Friends“—his upcoming performance at Green Music Center’s Weill Hall this Thursday (and on Wed, Fri, Sat and Sun at Davies as “Barantschik leads Mozart and Mendelssohn“)—I jumped. We chatted on the phone last Friday and he couldn’t have been warmer as he shared his amazing story. On Thursday, Barantschik returns to Green Music Center to lead the Orchestra in an irresistible program he’s put together showcasing strings. 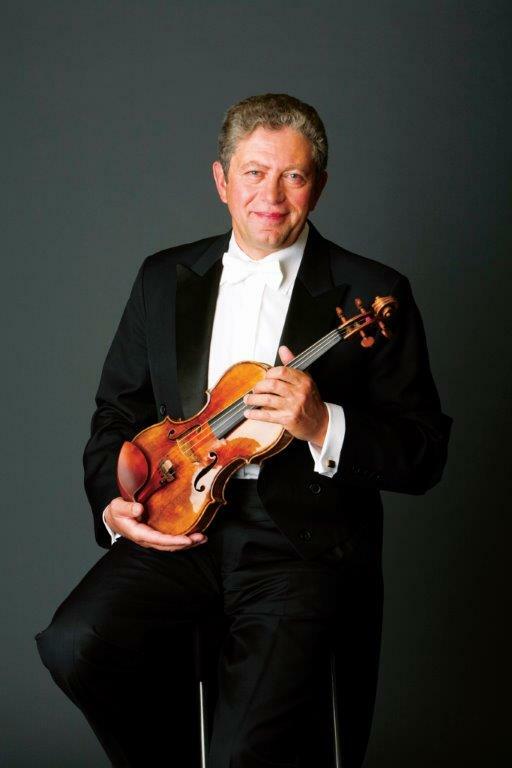 Following a lovely early Mozart “Divertimento in F major for Strings,” Barantschik takes center stage to play Mendelssohn’s “D minor Violin Concerto,” one of the Romantic master’s finest creations and a delightful surprise for concertgoers who only know its more famous sibling, the E Minor. He’ll be playing “The David,” the 1742 Heifetz Guarnerius del Gesù violin owned for many years by his idol, Jascha Heifetz. 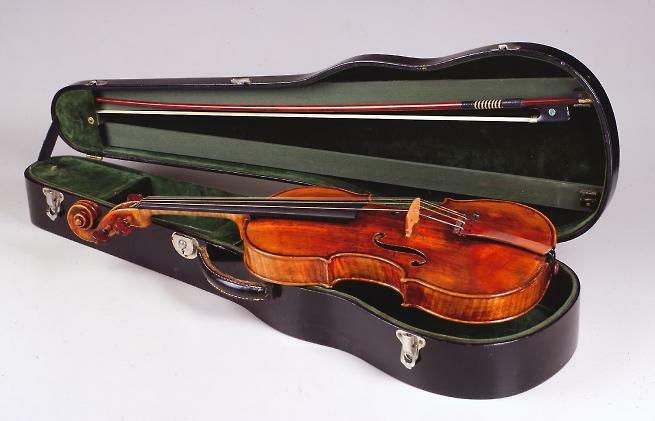 The violin, valued at over $6 million, was bequeathed to the Fine Arts Museums of San Francisco (FAMSF) in 1989 by Heifetz and offered as an extended loan to SFS in 2002, where it has been cared for and played by Barantschik. Barantschik insists that the dollar value on the instrument is “completely irrelevant” as it’s priceless and could “never be replaced.” Of course there are a few restrictions. This will be “The David’s” second appearance at Weill Hall—1 of 2 locations outside of San Francisco where he is allowed to take it, the other being the Mondavi Centerfor the Performing Arts at UC Davis. Aside from these two exceptions, the instrument never travels outside of Davies. Also on the program is Britten’s winsome “Simple Symphony,” a salute to the composer’s centenary and “Melodia-Libertango,” the sultry music of Argentine composer Astor Piazzolla, the king of nuevo tango, with guest performer Seth Asarnow on the bandoneon. 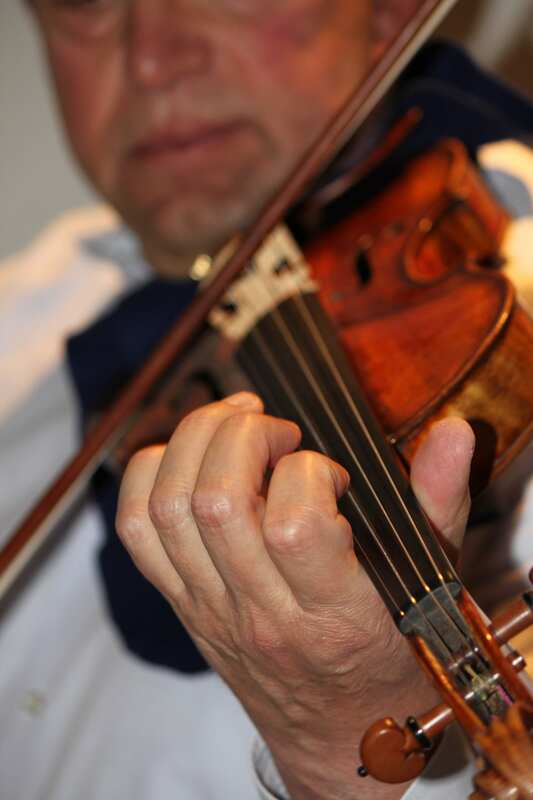 Where did you grow up in Russia and what was your first experience with the violin? Alexander Barantschik: I was born in 1953 in St. Petersburg, Russia (then ‘Leningrad’), which was and still is the cultural capital of the country. My family wasn’t musical, no musicians except for a very distant relative, Yefrem Zimbalist, who lived in the States but I never met him because he’d emigrated at the beginning of the 20th century. It was pure coincidence that my mother tried to get me some lessons at the music school which was just across the road from our home. I could walk there by myself every day and my parents thought this would keep me busy and off the streets, which was just what happened. I was almost six when I was admitted. My first instrument was an accordion because there was no space for another violin student in the school. I don’t remember anything about that accordion but a violin spot opened up and the teacher thought I had a pretty good sense of rhythm and pitch and so I started playing the violin. After a few years, I made some progress. I can’t say I was completely dedicated to practicing or spent many hours at it but I loved music. It took quite a few years before I truly understood the importance of practice and of the violin itself. I was probably 12 or 13 when I started thinking this might be forever, this might be my life, and then I started practicing and then I started making real progress. Historically, was there a “Russian style” of music playing and was that around when you were studying and is it still around today? Who were there big mentors that you looked up to, or, perhaps, wanted to topple? Alexander Barantschik: When we think of a Russian school of violin, we should think about Leopold Auer, basically the first teacher who could claim that he was important for the whole process of teaching great players. His students, apart from Heifetz, were phenomenal violinists. He wasn’t Russian but a Hungarian Jew who came to Russia (in 1868) and his Russian wasn’t perfect but he was teaching his students in a unique way—they all had something special in common. That tradition of playing was very deeply appreciated after he left and went to live in New York for the last part of his life. I cannot say there is a Russian tradition of violin playing that exists right now. The world is smaller, faster, and within one week, you can be in three different continents, so things are not as personalized. There are great players of the past who are impossible to imitate…Jascha Heifetz, Yehudi Menuhin—great players who were absolutely unique. How do you feel about David Oistrakh’s playing and did you ever happen to meet him? 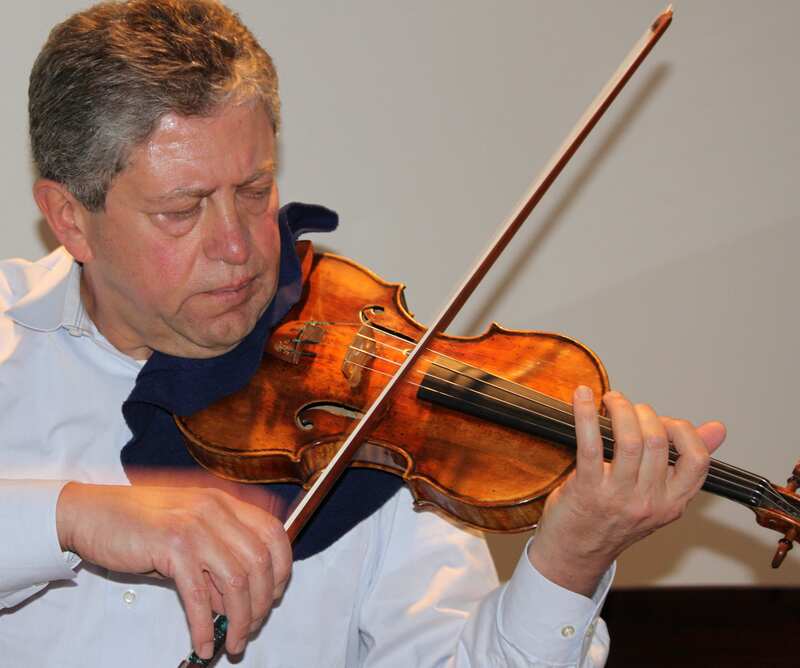 Alexander Barantschik: I loved his playing and heard him play much more than any other violinist as he was in Russia and played regularly with the St. Petersburg Philharmonic. I was dreaming of becoming his student at the Moscow Conservatory and was able to audition with him when he was performing in St. Petersburg. I met with him in his hotel room and I played for him for about 20 minutes and he was extremely nice and accommodating and sympathetic. He listened and made some corrections and tried to see how I reacted to his comments. His last question after I had played was simple—’Do you think you really love violin?’—and he looked straight into my eyes as he asked me that. I think I said, ‘I dearly love violin.’ After a second, he said, ‘Ok… I will accept you into my class.’ I couldn’t have been happier than I was at that moment. As I was preparing to take other exams at the conservatory, I heard the tragic news that he been on tour to the Netherlands and had died in Amsterdam after his concert. I never became his student and that was the end of my training but I’m so glad I have this wonderful memory of playing for him. What were the circumstances that brought you to the West? Alexander Barantschik: By the time I was in my mid-twenties, I was a member of the St. Petersburg Philharmonic Orchestra and toured regularly. I had visited Western Europe and Japan but I felt that, for my musical development, I needed to absorb different cultures and traditions and that the only way to achieve this was to emigrate from Russia, which I did at 26. My first country was Germany, where I was concertmaster with the Bamberg Symphony Orchestra. This was my first job and I spent three years there learning all about German traditions—Beethoven, Bückner, Haydn—and I broadened my view and I’m still learning from different traditions today. How difficult was it to get out of Russia to Germany? Alexander Barantschik: It was not easy and, let’s say, it was made difficult. I left Russia with one suitcase—no money, no job, no references and almost no violin. My violin was not a Guarneri but it was a nice little violin from Tirol, Austria, and at the last minute, I was not allowed to take it with me. I ended up going to a department store, to the music section and buying a simple violin that had been made in a furniture factory. It looked horrible and sounded accordingly. I played my first audition, for the section, on that. Afterwards, the committee came to me and said they were happy to offer me a job with the orchestra but that in one week they would have another audition for concertmaster and they asked me if I’d like to participate. I didn’t think about it and just said yes. They then asked me about my violin which was very bright red and said they’d never seen anything like it before. One week later, I returned for the concertmaster audition and played all the solos and concerti and I got that position. That was when they presented me with a very beautiful Guadagnini violin made in Cremona and the legend was that it has belonged to a famous German violinist Joseph Joachim who was a close friend of Brahms and who wrote cadenzas to almost every important classical violin concerto. Do you still have that red violin? Alexander Barantschik: No. I lent it to someone and this person never returned it and for that I am very sorry. I would love to frame it and hang it on the wall for my students at the conservatory to see what my beginnings were. 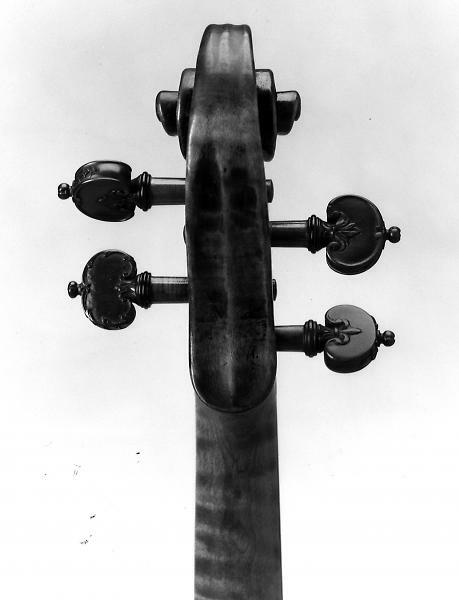 What did it feel like the first time you had Jascha Heifetz’s fiddle in your hands? How long has it taken you to become truly comfortable with the fact that this is now your violin? Alexander Barantschik: Of course, the very first time I held it, I was speechless because the sound of Heifetz had been with me in my ear since I was a child…I’ve listened to his recordings all of my life. The violin is legendary, with a very special history of ownership and craftsmanship but it is not easy to play. Players need to find the way to produce the sound it’s capable of and that requires a special technique. It took me many months, perhaps a year, to meet its demands and to make it my friend so it started to like me as well. Do you think that Guarneri has a unique voice? One of your SFS colleagues mentioned that he thought he heard a familiar voice from the Heifetz recordings when he heard you play it. Alexander Barantschik: I never tried to imitate Heifetz’s sound. First of all that’s impossible as there was only one Heifetz and there will never be another. So it’s not my intention but it does have a unique dark-colored sound and maybe some low notes sound a little familiar for those who are familiar with his recordings. You were MTT’s concertmaster in London Symphony Orchestra right? You obviously have a special rapport. What clicks? Do you and MTT ever share a vodka before or after a performance? Alexander Barantschik: We met in London. I joined the London Symphony Orchestra in 1989, the same year he started as principal conductor. We met in the recording studio when the orchestra was recording Richard Strauss’ “Ein Heldenleben,” which has a huge important violin solo. We had just one rehearsal and we didn’t have time to discuss things or work out the details—it was spontaneous—we both just trusted each other as musicians. After this very important and stressful recording session, we immediately became friends. I still have the cd and it’s one of the best I ever made. Our collaboration has continued for a little over 30 years now. As for the vodka, usually, we are both pretty exhausted after a performance and we don’t have any vodka with us. Maybe, on a couple of occasions, when it was the end of the season, we shared a drink. 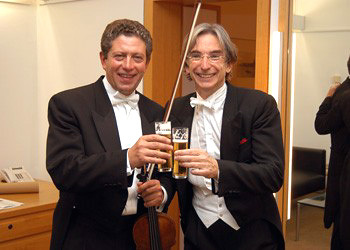 SFS Concertmaster Barantschik and Music Director Michael Tilson Thomas in Cologne, Germany, in 2002. What’s the most stressful aspect of being the concertmaster? Alexander Barantschik: It is a stressful job but maybe a better word is complex. The most stressful period was when I first started my career as a concertmaster and I had to basically learn the entire orchestral repertoire, an endless body of work. I’m still learning new pieces and relearning old pieces and forced to make important decisions. It’s not only about playing—it’s about preparing sheet music, working with guest conductors, auditioning musicians and all of that is very complex in this huge organization. Historically, the SFS concertmaster has been the only musician not to have tenure. In the last SFS contract, you were given tenured status and all concertmasters, hereafter, were given the chance to be tenured. Was that important to you? Alexander Barantschik: I think the most important aspect was the recognition of me being an integral part of the orchestra, not as being slightly different from the others. Why did you select the Mendelssohn Violin Concerto in D Minor and what sets it apart from his Concerto in E Minor, one of the five great violin concertos? Alexander Barantschik: The D Minor that I will be playing is written for violin and strings whereas the E Minor is written for the whole orchestra with wind and brass. This program is dedicated to SFO strings and that was my main reason. It is also rarely played and, in fact, was completely ignored until Yehudi Menuhin found it in the 1970’s and edited the score and performed it for the first time in a couple of hundred years. So, this is not so popular but it was a master work when Mendelssohn wrote it as a 13 year old and it has all the qualities of the works he composed in his advanced age. You can hear from hear very first few bars that it is Mendelssohn—it is youthful, beautiful, dramatic and it speaks to my heart. Any contemporary music for violin that you find intriguing? Alexander Barantschik: Of course, it depends what we’re talking about…in terms of the 20th century, which is already the last century, I love Stravinsky, Prokofiev, and Shostakovich the most. If we are talking later, and more avant-garde, then there are very interesting pieces that have a new language. The only way to encourage young composers to write is to perform their works. Without performing, we’ll never know where music is going. On two occasions (2003 and 2012), I played the “Concerto No. 4 for Violin and Orchestra” (written in 1984 as a commission for the Berlin Festival) by the Russian composer Alfred Schnittke (1934-1998). I was a little nervous about how the audience would react as it’s a very complicated piece, not easy listening, but he’s one of my favorite composers and this is one of my favorite concertos. The audience and the orchestra loved it in 2003 and when I played it nine or ten years later, it was the same story…successful. Now, I am learning and I hope to play a concerto by John Adams. Where else aside from Russia, London and CA have you lived and which place do you consider “home”? Alexander Barantschik: Without any doubt, home is where my family is— my wife Alena and son Benjamin—and we’ve been here since 2001, 13 years already. I am very happy to call CA, the Bay Area, specifically San Mateo, where I live, my home. After I left Russia, I lived in Germany for three years and then in Amsterdam for 22 years where, for 16 years, I combined my job as concertmaster with the Netherlands Radio Philharmonic with my concertmaster position at LSO. I then moved to California and started my job here at SFS. Does your son have any interest in pursuing music? Alexander Barantschik: He’s a high school junior now. He loves math, science, and computer science and he plays piano for his pleasure and loves classical music but he has no desire to pursue music professionally. Russians have a marvelous and highly creative form of cursing. What’s your favorite Russian curse? Alexander Barantschik: Honestly, I don’t curse so much. We do have a saying, ‘Ni puha ni pera,’ which is something like ‘break a leg,’ which is what you say to every musician or performer about to go on stage. The reply to that is always ‘K chortu,’ which is ‘Go to hell,’ a good omen for Russians. How do you feel about performing at Weill Hall? Alexander Barantschik: We are used to our hall, Davies, where we perform and rehearse every day and it’s challenging to leave that. Weill Hall is much smaller than Davies, has a completely different shape, and is very different acoustically from Davies. Since we don’t have any rehearsals at Weill Hall, or at the Mondavi Center, it’s always challenging to get the sound just right. We don’t have any experience just sitting in the hall and listening either. On stage, we are hearing things that are so different from what you’re hearing and we have to adjust immediately without even hardly having a chance to play. This time, we’ve got a small ensemble. I will come a bit early and check out the acoustics to make sure I remember what it’s like there. Details: Alexander Barantschik and SFS perform “Barantschik and Friends” at Green Music Center’s Weill Hall, Thursday, January 23, 2014 at 8 p.m. AND “Barantschik leads Mozart and Mendelssohn” at Davies Symphony Hall on Wed (Jan 22, 8 p.m.), Fri (Jan 24, 6:30 p.m.), Sat (Jan 25, 8 p.m.) and Sun (Jan 26, 2 p.m.). Tickets at Green Music Center are $20 to $156 (click here to purchase) and are $15 to $109 at Davies (click here to purchase.) For more information, call (415) 864-6000. For more information about San Francisco Symphony’s four concerts this season at Weill Hall, click here. He grew up in Texas, studied journalism and German at Texas A&M, was married briefly to Julia Roberts, loves the sport of reining and is known for his wild locks and wily sense of humor. Over the span of his 30 years as a singer-songwriter, Lyle Lovett has recorded 14 albums, released 22 singles and won four Grammy Awards. While he’s best known for his contribution to country music, Lovett is also at home with blues, jazz, swing, folk, and rock and is admired for his authenticity and audience engaging performances. Bonnie Raitt, with whom he made his first big tour, following her bus in his pickup, said that when he looks her in the eye, “her knees buckle.” Singer and songwriter, John Hiatt, a native of Indianapolis, is also no stranger to country influences and his music also mixes in folk, blues and rock. Hiatt has released 19 studio albums and has had 11 Grammy nominations. His songs have been recorded by countless musicians from Bob Dylan to Bonnie Raitt, and Iggy Pop to Keith Urban. An Acoustic Evening with Lyle Lovett & John Hiatt, at Green Music Center’s Weill Hall, on Monday, November 18, 2013, brings their nationwide tour to our doorstep, showcasing these two remarkably gifted singer-songwriters who have performed together periodically over the past 15 years. Weill Hall….More than Classical— Green Music Center’s Weill Hall, which opened in September 2012, is one of the world’s most acoustically superb concert venues. The hall’s variable acoustics, engineered by Larry Kirkegaard, are achieved through the use of motorized fabric banners on the east and west walls. By adjusting these banners, the hall can be fine-tuned for the specific genre of music being performed—from a single vocalist to a full orchestra setting. This season, performances have ranged from the electric jazz of Herbie Hancock to the soulful fado of Mariza to the eastern influenced riffs of the Silk Road Ensemble. Weill Hall lobby opens one hour prior to performances and has well-stocked refreshment bar and the concert hall opens 30 minutes prior to performances. Prelude Restaurant is open before the concert and after the performance. The performance will last roughly 2 hours. Details: An Acoustic Evening with Lyle Lovett & John Hiatt is 8:00 p.m., Monday, November 18, 2013, at Weill Hall, Green Music Center. GMC/Weill Hall is located on the Sonoma State University campus, 1801 East Cotati Blvd., Rohnert Park. Parking: Parking is included in the ticket price. Park only in the Green Music Center lots (directly in front of the concert hall, or you may be ticketed. Tickets: The concert is sold-out. A small number of tickets are expected to be available on Monday throughout the day on a first come first serve basis due to patrons donating or exchanging tickets. Tickets may also be available right before the concert. Ticket purchases for this concert are best made by phone through the Sonoma State University Box Office at 866.955.6040 or in person at the GMC Box Office, adjacent to the courtyard of Weill Hall, which is open Monday through Friday from 8 a.m. to 4:30 p.m. and one hour before all performances. As an appetizer to the delights that await us at Weill Hall in its second year, the San Francisco Symphony (SFS) heads North this Thursday, September 12, for “MTT conducts Tchaikovsky’s Piano Concerto No. 1,” the first in a four concert series at Green Music Center (GMC) scheduled for the 2013-14 season. In his only GMC performance this season, Michael Tilson Thomas (MTT), who became SFS Music Director in 1985, will lead SFS in a program that includes the highly-anticipated West Coast premiere of young Canadian conductor Zosha Di Castri’s “Lineage.” Di Castri, 28, is the first recipient of a New Voices Commission a program conceived of by MTT in collaboration with SFS, the New World Symphony Orchestra and publishing house Boosey & Hawkes. 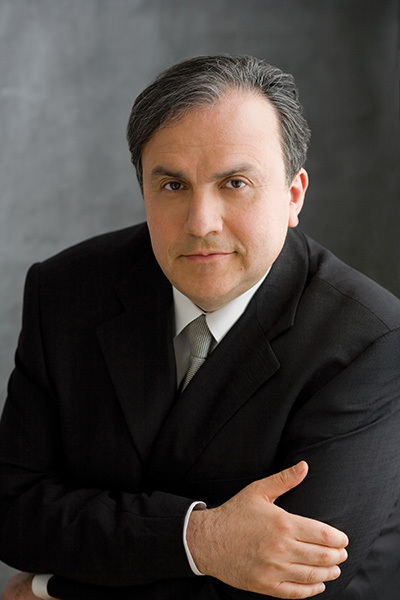 The headliner is renowned guest pianist, Yefim Bronfman, who joins SFS for Tchaikovsky’s First Piano Concerto, one of the musical icons of Russian Romanticism and one of Bronfman’s signature offerings. SFS also plays Prokofiev’s otherworldly, outrageous, and over-the-top Third Symphony, based on material from the composer’s daring opera The Fiery Angel. Inside Music at 7 PM: Composer Zosha Di Castri and Peter Grunberg, musical consultant to SFS and Musical Assistant to MTT, will give an informative talk. Free to ticketholders. Zosha Di Castri— The inaugural New Voices composer, Zosha Di Castri is a Canadian composer and pianist living in New York. She is currently pursuing doctoral studies in composition at Columbia University, studying with Fred Lerdahl and teaching composition, electronic music, and music history. Her work has been performed in Canada, the US, and Europe by the Edmonton Symphony Orchestra, the Internationale Ensemble Modern Akademie, L’Orchestre de la Francophonie, the NEM, JACK Quartet, L’Orchestre national de Lorraine, members of the L.A. Philharmonic and Chicago Symphony Orchestra, and Talea Ensemble. She has participated in residencies at the Banff Center, Domaine Forget, the Nouvel Ensemble Moderne’s Forum, and the National Arts Centre’s summer program. She was named a laureate of the 3rd International Composer’s Competition for the Hamburger Klangwerktage Festival, won two SOCAN Foundation awards for her chamber music in 2011, and in 2012, tied for the John Weinzweig Grand Prize for her first orchestra piece Alba, commissioned by John Adams and Deborah O’Grady and premiered at the Cabrillo Festival in 2011. Recently, her work Cortège garnered her the Jules Léger Prize for New Chamber Music. Di Castri’s work includes interdisciplinary collaborations in the realms of electronic music, sound installation, video, performance art, and contemporary dance. Her latest mixed-media works include Akkord I for flute, piano, electronics, and large sculpture, and a collaboration with choreographer Thomas Hauert of the ZOO Contemporary Dance Company on a new piece for electronics and dance at Ircam in Paris. She is also creating a new evening-length work for ICE in collaboration with David Adamcyk for ICElab 2014. Details: “MTT conducts Tchaikovsky” is September 12, 2013 at 8 PM at Green Music Center. Tickets $156-$20. Advance ticket purchase for SFS at Green Music Center must be made through the SFS Box Office Box Office at (415) 864-6000 or online here. You can choose your seat yourself only by phone; if you purchase tickets in advance online, best available seating will be assigned. Tickets can also be purchased on September 12 in person at the Green Music Center Box Office one hour before the performance. As of Tuesday morning, there was amply orchestra seating available. For more information about the Green Music Center, visit www.gmc.edu.